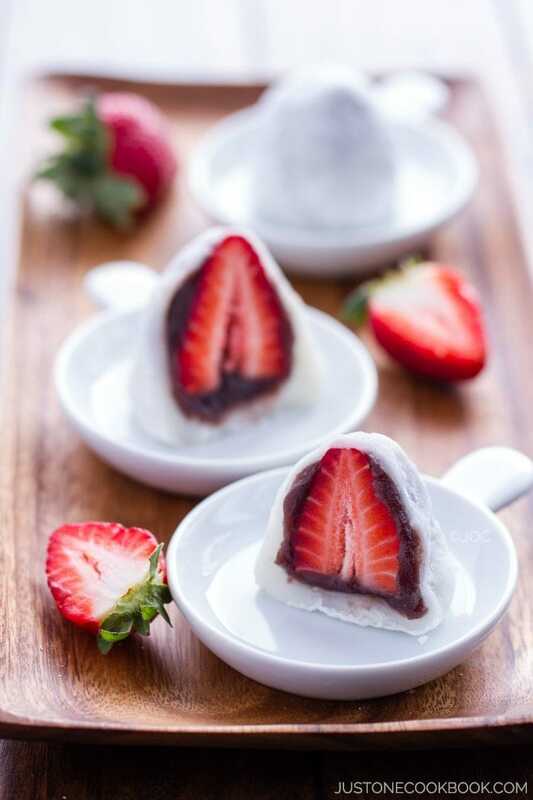 Encased in a soft wheat dough, filled with sweet red bean paste, and steamed to perfection, Manju is a classic Japanese confectionery (wagashi). When you crave for a fun, sweet treat, these dumplings will hit the spot! Enjoy with a hot cup of green tea. From Mizu Yokan to Daifuku, there are endless varieties of traditional Japanese confections called wagashi (和菓子). But to make at home, Manju (饅頭) is the best. It’s one of the simplest Japanese sweets you can make in your kitchen. Manju was first introduced to Japan in 1341 when a Japanese envoy came back from China and brought back mantou (饅頭) with him. The character for mantou is read as”manjū” in Japanese. 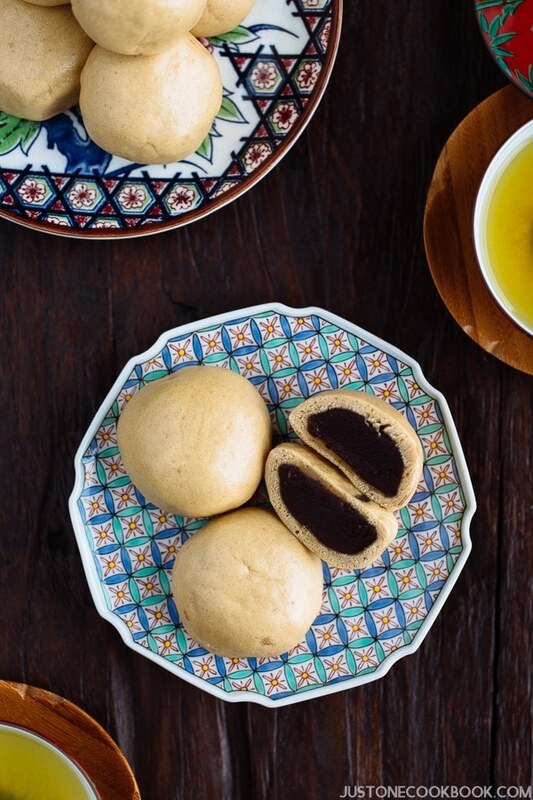 Since then, Manju has been a popular sweet for generations after generations. You can easily purchase these inexpensive treats from street vendors and wagashi shops everywhere. 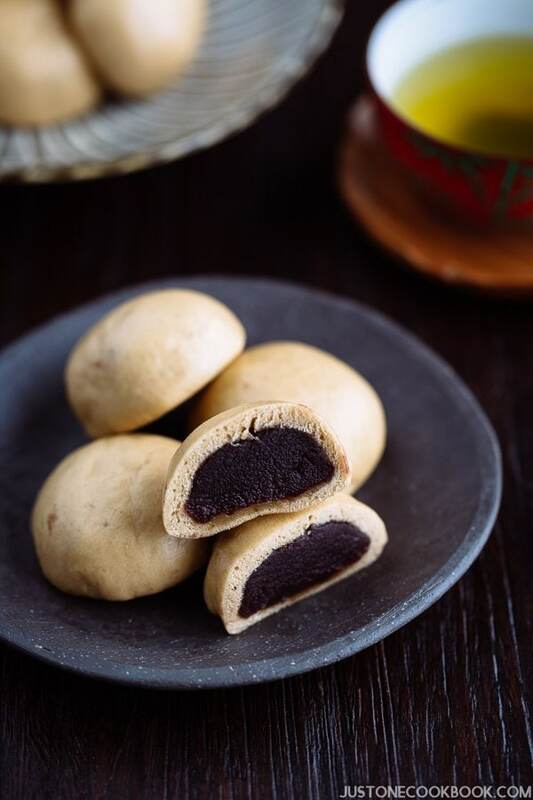 There are many variations of manju, but the most common one is the steamed manju with thin fluffy bun filled with sweet red bean paste. To put it in a nutshell, there are two main types of manju: Baked Manju (焼き饅頭) and Steamed Manju (蒸し饅頭). Not to mention, there are endless regional varieties with different shapes, sizes, and fillings with its regional touch. 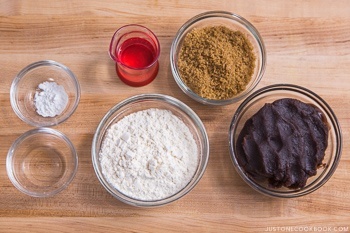 For fillings: The most common filling, red bean paste, come in different consistencies: koshian, tsubuan, and tsubushian (more about it here). 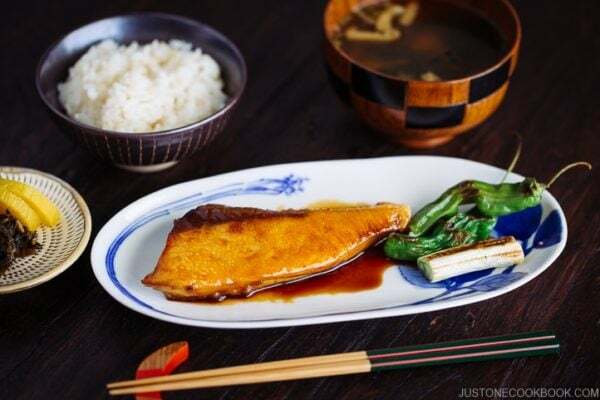 Other fillings include uguisu an (bean paste made with peas), shiro an (bean paste made with white kidney bean), chestnut paste, sesame paste, Matcha bean paste, Miso bean paste, etc. For buns: We can divide manju into five types. 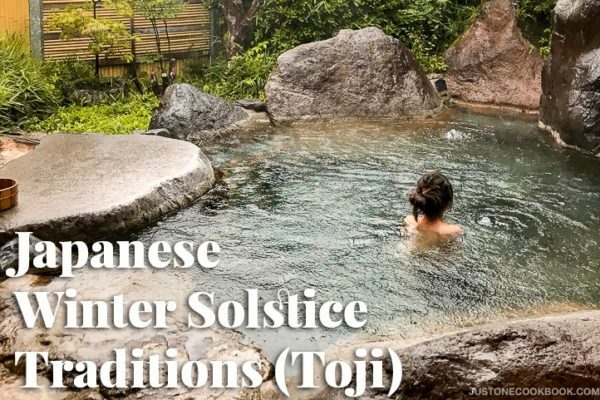 Also known as Cha Manju (茶饅頭), Rikyu Manju (利休饅頭), Kokuto Manju (黒糖饅頭), Onsen Manju (温泉饅頭), Usukawa Manju (薄皮饅頭). The bun is made from wheat flour and brown sugar. The bun is made from rice flour using grated yams. 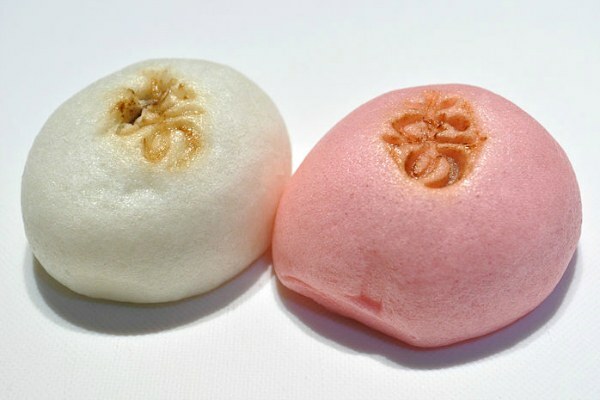 Kohaku Manju (紅白饅頭), picture below, and Oribe Manju (織部饅頭) are good examples. On celebratory occasions, the Japanese eat Kohaku Manju (紅白饅頭) – red and white manju. Red (ko 紅) and white (haku 白) colors represent the symbol of happiness and lucky colors from ancient times. 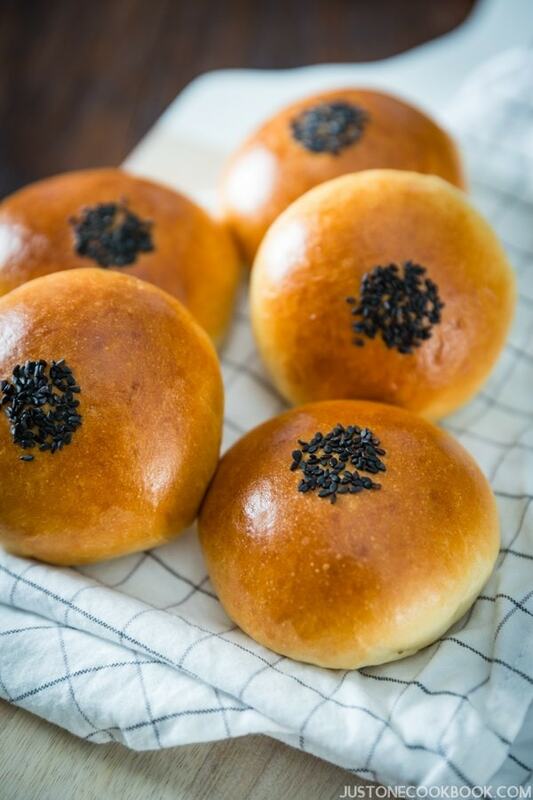 The buns are made from wheat flour using yeast mash/starter. 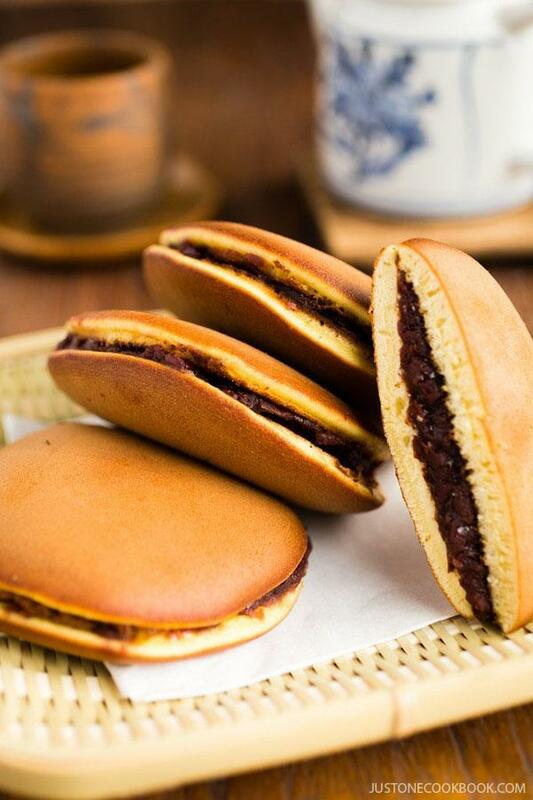 This is the origin of the idea for Anpan. 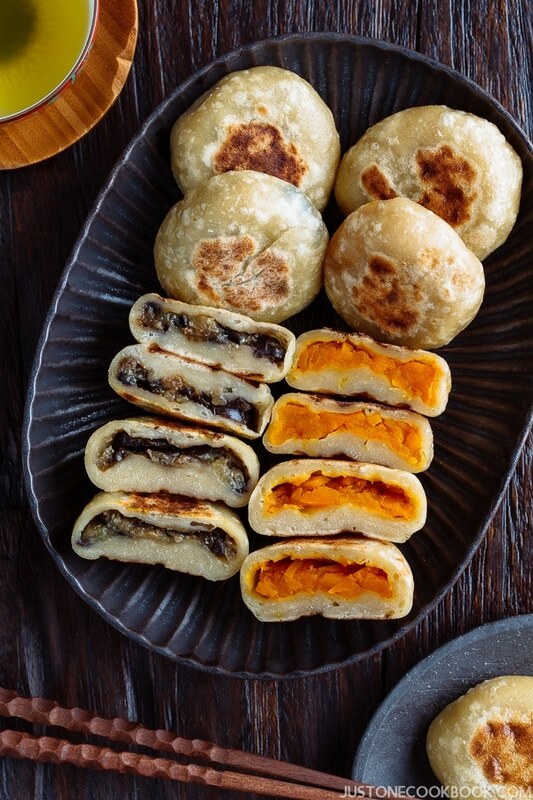 Toraya Manju (虎屋饅頭) is a good example. The buns have a texture like Castella. Momiji Manju (もみじ饅頭), Kuri Manju (栗饅頭), Tou Manju (唐饅頭), Chidori Manju (千鳥饅頭) are good examples. The buns are made from wheat flour using miso. 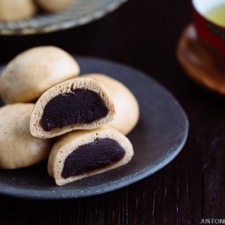 Minobu Manju (身延饅頭) is a good example. Is it just me or do you also think kneading is fun and we tend to over do? But if you want to make fluffy bun around the filling, over kneading is a big no-no. So don’t make the mistake. Just fold the dough a few times till the dough is pliable and easy to divide (not droopy). Don’t worry about making into a round shape like how you would do with bread dough. When press down the dough and make into a circle shape, make sure to only thin out the edges and keep the center somewhat thicker. 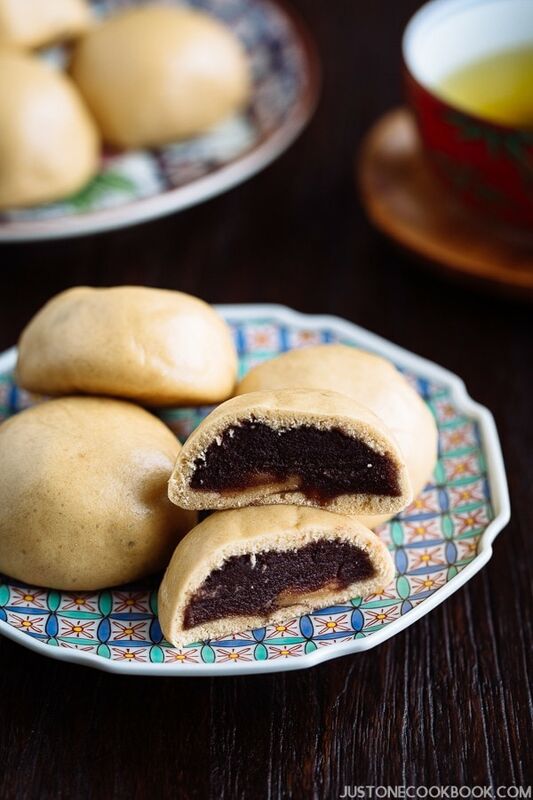 This way when you wrap the red bean paste with the dough, the seam line on the bottom won’t be too thick and your buns will have nice fluffy thicker dough than the bottom. If you thin out the center of the dough too much, your buns will be super thin on top and thick on the bottom. There are a couple of ways to add the filling in the dough. 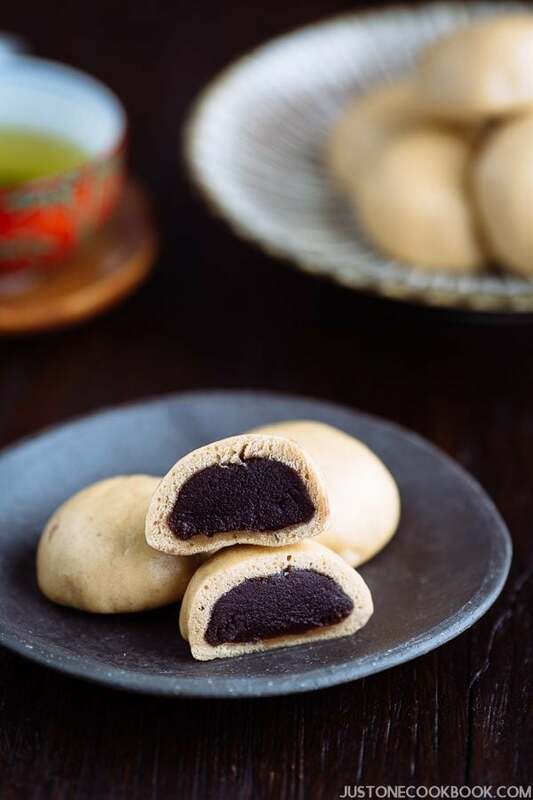 If you are a wagashi expert, you would put the filling on the circle dough and push the filling toward the dough with your fingers while you rotate the dough with the other hand….and voilà! The filling is magically inside the dough! Don’t know what I’m talking about? Check out this video as a guidance. For the beginners, let’s keep it simple. 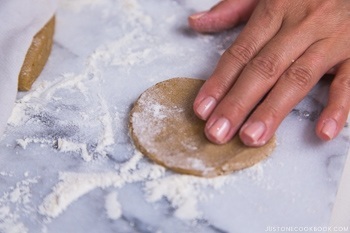 Gather the opposing edges of the circle dough and pinch the dough over the filling to seal tightly. Enjoy the steamed manju warm or at room temperature. I love brewing a pot of green tea to enjoy with the lightly sweet buns for my afternoon snack. They are freezer-friendly too! Make sure you cover each one with plastic wrap to retain the moisture while they are still warm, place the leftovers in a zip-lock bag to freeze, and just re-steam them when you want some buns anytime of the day! Gather all the ingredients. Cut a sheet of parchment paper into twelve (12) 2.5” x 2.5” (6 x 6 cm) sheets. 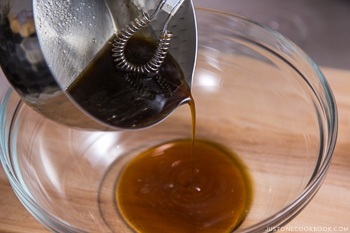 In a small saucepan, add water and brown sugar, and whisk to dissolve the sugar. Transfer to a large bowl and set aside to cool. Meanwhile wet your hands with a little bit of water and make 12 balls of red bean paste. Each ball should be about 1 scant Tbsp (20g). Combine baking powder and water. Add to the cooled brown sugar mixture and mix all together. Sift the flour and add to the brown sugar mixture. 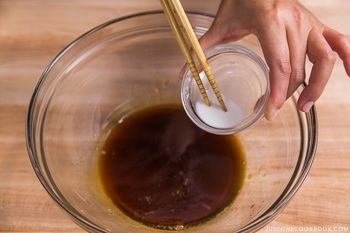 Combine the mixture with a silicone spatula, chopsticks or fingers. Pinch the clumps together into a ball. Cover with plastic wrap and set aside to rest the dough for 15 minutes in the bowl. Transfer the dough on a floured work surface and knead for 1-2 minutes, incorporating flour as necessary to get rid of stickiness. The texture of the dough should be pliable (in Japanese, we say the texture should be similar to the texture of ear lobe). Do not over knead. Once the dough is no longer sticky and smooth, form the dough into a stick, and cut into 12 pieces. 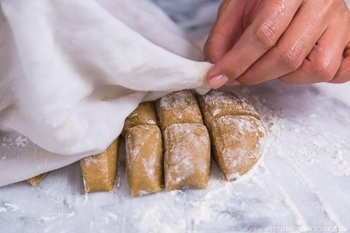 Cover them with a damp towel to prevent the dough from drying. Form one portion of the dough into a ball and flatten it so it becomes 2 inch (5 cm) in diameter. Then flatten the piece with your fingers and roll out to form a circle shape about 2.5 to 3 inch (6-7 cm) in diameter. Only stretch the outer edges of the dough and keep the center thick. 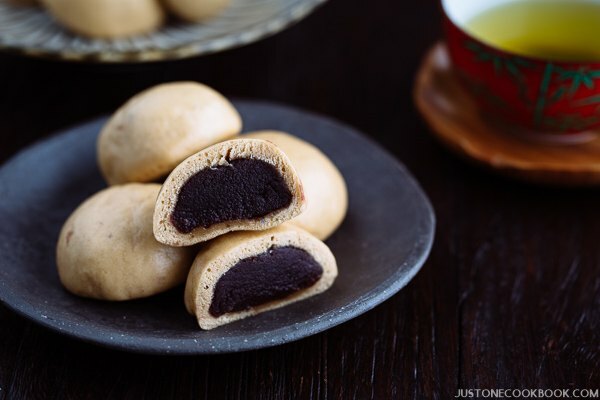 Place the red bean ball in the middle and pull each corner into the center and pinch to close the dough. Now you know why we need the outer dough to be thin. If you have thick outer dough, the pinched area will be harder to fold in. Place the manju on the working surface, seam side down. Rotate the dough a few times to shape nicely. Place it on to the parchment paper. Cover the manju with a damp towel to prevent from drying. Repeat with the remaining dough. Set up a steamer. Fill the wok (or pot) with 2 inches of water. Bring the water to a boil. Steam for 10-12 minutes with high heat (this creates lots of steam). 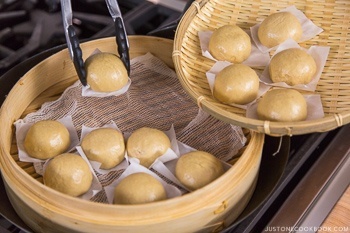 Once they are done cooking, remove manju from the steamer and let cool on a wire rack or bamboo sieve (so the air/heat won’t trap on the bottom of manju). While they are still warm, wrap each manju with plastic wrap individually. This will help to retain the moisture. Enjoy! Cake Flour: If you don’t have cake flour, you can substitute with all-purpose flour and corn starch. Here’s how. Prepare 1 cup all purpose flour in the bowl. Remove 2 Tbsp from the bowl. Add 2 Tbsp corn starch back to the bowl. Now you have 1 cup cake flour. Be sure to sift the flour to distribute the cornstarch well before using it in your cake batter. I have a tendency to be too enthusiastic of a kneader, so I appreciate the tip to watch it when making these! Delish looking goodies — really nice. Thanks! And Happy Holidays! That’s a great idea for homemade cake flour 😛 Great recipes! I’d like to make these manju to give to someone, but I don’t know if they have a steamer…is it possible to refrigerate these for a day or so, and microwave them to warm them up? Are they alright eaten at a cool temperature? Love your recipes, already tried one for koshian. Want to make manju but I don’t have a steamer. Is it possible to bake them in the oven? But I also like to suggest to make your own steamer. I quickly explain the steamer set up in this post. Give it a try! Nami, thank you for the prompt reply! Going to try make a steamer and try traditional recipe next time.